The Washington Hook and Ladder 9 operated from its firehouse at No. 217 East 28th Street prior to 1865. One of many volunteer companies scattered throughout the city, its members were volunteers who lived in the neighborhood. When a fire broke out, the men called "laddies" would scramble to the firehouse. Fire companies often vied with one another to arrive at the fire first, or to become more skilled at extinguishing blazes. The end of the disorganized system came following the devastating fire that destroyed Barnum's Museum in 1865. The State Assembly passed the Act of 1865 that coupled Brooklyn and New York with a professional "Metropolitan District" fire department. Washington Hook and Ladder 9 was replaced on October 11, 1865 by Hook and Ladder Company No. 7. Fighting fires in the crowded city was made more dangerous and difficult because of the highly flammable materials that were so often involved. Houses and apartment buildings were lit either by kerosene lamps or gas; carriage houses and stables were filled with hay and grain; and distilleries, pharmacies and printing houses stored explosive components. An example was the devastating blaze that broke out in Walter Briggs's large livery and boarding stable on February 13, 1879. The New York Herald's headline read "Insatiate Flames" and the article noted "A large quantity of hay and straw was known to be stored near the very spot from which the flames were issuing." The firefighters' valiant efforts were split between extinguishing the inferno and to saving the horses. There were, in addition, dozens of expensive carriages and sleighs stored on the various levels of the structure. Three firefighters were injured, one of them Washington Ryer who was briefly buried when the roof caved in. Tragically, while the firefighters managed to save the building from complete destruction, 70 horses, some of them quite valuable, were lost. The same year of the Brigg's stable fire Napoleon LeBrun was appointed official architect for the New York City Fire Department. A year later, after his son Pierre joined him, his firm became N. LeBrun & Son. By 1895 when he stepped down, he and his son would be responsible for designing 42 fire department structures. Among their last jobs was the refurbishing of Hook and Ladder 7's firehouse in 1893. The remodeling was so extensive that the Fire Departments 1894 report called it a "new building, rebuilt for Hook and Ladder Company No. 7." The result was signature LeBrun. The stone-clad base followed the expected firehouse arrangement--a centered truck bay flanked by a doorway and window. The sparse decoration at this level relied on two carved shields with flowing ribbons below the dentiled cornice. The upper two stories were faced in variegated Roman brick trimmed in limestone. A common feature in LeBrun designs was the central plaque, inscribed with pertinent construction information (the mayor, commissioner, etc. ), flanked by decorative rondels that announced the date. Splayed lintels above the second floor windows and voussoirs above the third were executed in brick and enhanced with scrolled keystones. The pressed metal cornice featured an intricate frieze and a double row of brackets, the topmost of which terminated in lions' heads. The members of Hook and Ladder No. 7 had scarcely settled into the refurbished firehouse before a frightening blaze broke out in a tenement house at No. 74 Pearl Street on the night of January 2, 1894. Fireman John P. Howe jumped from the moving truck and ran ahead to rescue the tenants. The Evening World reported "While carrying out Bridget Maloney an invalid, his hands and face were burned, but notwithstanding this Howe returned and saved Mrs. Eliza Keenan and her daughter Lillie." Howe was involved in a nearly unbelievable act of heroism exactly two years later to the day. Fire erupted in the Geneva Club on Lexington Avenue, an organization of hotel employees. Several members lived in the upper floors of the three-story building. John Howe was driving the truck and as he pulled up to the scene, according to the New-York Tribune, "There were faces at the windows of the upper floors where the occupants had been cut off from escape to the street. The lower rooms were all aflame." The article noted "The spirited horses he was handling scarcely came to a halt before Howe had sprung from the truck." He banged on the door of the house next door and rushed upstairs to a window. He stretched his body across the gap between the buildings to reach Max Henshel, "who was at the window of the burning house begging for help." Fireman Pearl held Howe's legs so he would not tumble down the gap between the buildings. Henshel was safely pulled through the window. Next came August Lang. And then Frederic Schmidt appeared. Behind him smoke and flames were enveloping the room and the Tribune said "he was desperate." "Before Fireman Howe could get himself properly balanced to reach for the imperiled waiter, the latter sprang from the window ledge and threw his arms around the fireman's neck. The man's weight dragged Howe from the window-ledge, and it seemed certain that both men would be dashed to death on the pavement." But Howe held on, and Pearl, still clutching his legs, "reached out and, by an almost superhuman effort, succeeded in drawing Schmidt through the window. He then helped Howe in." In the meantime the other members of Hook and Ladder 7 were busy rescuing other residents. Steward Bergmann was stuck on the roof of the rear extension with his wife and child. They were carried down on a ladder by firemen. Two other occupants, a man and a woman, had jumped to the roof of the porch. Adelaide Junker suffered a sprained ankle; but both were carried down by fire fighters. 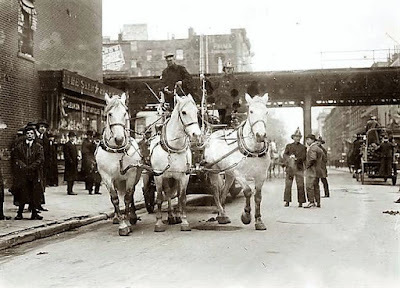 Hook and Ladder 7 responded to one of New York's greatest disasters in the early 20th century--the January 27, 1902 dynamite explosion being used in the construction of the subway on Park Avenue. Hundreds were injured, several killed and damage to buildings extended for blocks. 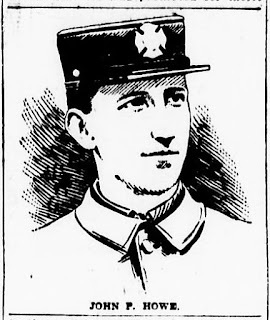 Fireman James Francis Kiernan found construction foreman Tubbs in the ruins. As he carried the man out, a second explosion occurred. The Evening World reported "The young fireman's arm was broken and he was blown four feet into the air, but he kept his head and got Tubbs safely out of danger." Amazingly, according to the newspaper, this was just one of "a dozen escapes from death and [he] has saved a great number of lives." His cat-like defiance of death earned him the nickname "Lucky Jim." 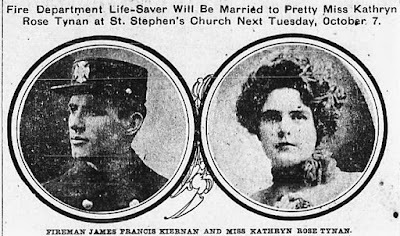 Later that year the same newspaper reported on his upcoming wedding, saying his luck continued in managing to win the hand of Kathryn Rose Tynan. Kathryn, explained the newspaper, worked in a 23rd Street department store "and has such a reputation for beauty that she has attracted general attention among patrons of the store." Press coverage routinely lauded Hook and Ladder 7 for its heroism and expertise. But that was not the case on February 22, 1903. A storm had covered the city streets in deep snow. Clearing the roads was, obviously, much more labor intensive than today. On the 21st when the firefighters were called to a blaze, only the avenues had been cleared. The company's truck was pulled by three powerful horses, but they labored through the deep snow, becoming stuck several times on East 47th Street. The New-York Tribune reported that they "were badly used up" when they once again got stuck just before reaching Third Avenue. The driver's solution was to whip them "furiously." When the horses still could not pull the truck from the snow, he climbed down "and lashed them from the front." The newspaper said "The lashing of the horses caused a crowd to gather, and several women and men expostulated with the firemen. They paid no attention, however, but continued to lash the rearing animals." By coincidence, the Fire Department's chief veterinarian, Chief Shea, was heading downtown on the Second Avenue streetcar and saw what was going on. He ordered the men to stop, "and then patted and petted the animals until they recovered their good nature." He then put the firemen to work. "They used their utmost strength to start the heavy truck, and succeed[ed] in doing so." It would not be many years, however before the horses were gone and Hook and Ladder 7 received its "Automobile Hook and Ladder Truck." Then in the spring of 1915 the fire department would have to replace it. On February 17 that year Fireman Harry Flynn was driving the truck "at full speed" down Second Avenue to a fire on 19th Street. A streetcar driver, hearing the sirens, panicked and stopped short. To avoid a collision Flynn swerved and disaster followed. The Evening World reported "The rear wheel of the big truck struck an elevate railroad pillar. The wheel was slewed around so that the axle was parallel with the body of the truck. Flynn was hurled to the ground, but was not hurt." It was the end of the shiny fire equipment. "The truck was put out of commission." The year 1920 exemplified the heroics and the dangers of the job. On February 3 the men responded to a tenement fire on Fourth Avenue. Fireman Thomas Costigan found Agnes Butcher unconscious on the fourth floor and carried her to safety; and James Tubridy "forced his way" into the rear of the building to rescue "two hysterical girls," as described by The New York Herald. A week later the company rushed to a fire in the Oliver Film Company on February 7. Motion picture film was made of celluloid, a highly flammable material that burned quickly and produced an extremely hot flame. When burned it produced poisonous gases and toxic smoke. Fireman James McMahon was overcome and was carried unconscious from the second floor. And the following month, on March 8, the men faced an especially tricky blaze. Fire broke out in a middle car of a 10-car train on the Third Avenue Elevated. An aerial ladder was extended to the fire, but the men could not pour water on it until the electricity to the tracks was turned off. In the meantime residents, whose homes were mere feet from the tracks, worried that the delay would allow fire to spread. Like most fire companies, Hook and Ladder 7 had a mascot. And theirs in 1937 was iconic--a black-spotted Dalmatian named Smoky. The New York Times noted on April 21 "Smoky, who is 3 years old, rides to fires on his company's truck and recognizes his company's alarm signal, jumping to his station like a veteran, according to his master, Fireman Robert Riley." But on April 20 that year Smoky embarked on an adventure. He strolled out of the firehouse and headed east to Madison Avenue. Apparently the headquarters of the American Society for the Prevention of Cruelty to Animals looked inviting, so he dropped in. The Times reported he "made himself at home in the lobby." He stayed there until officials tracked down his owners through his license tag. Society agent Tom McQuade then "escorted him home." Members of the company would continue to receive commendation for their service throughout the decades. In 1951 Fireman Jacob H. Soffel, for instance, was awarded a medal for bravery. Rather surprisingly, given the small scale and age of the building, Hook and Ladder Company 7 continued on in the 1893 firehouse until August 6, 1968, when it moved in with Engine Company 16 at No. 234 East 29th Street. 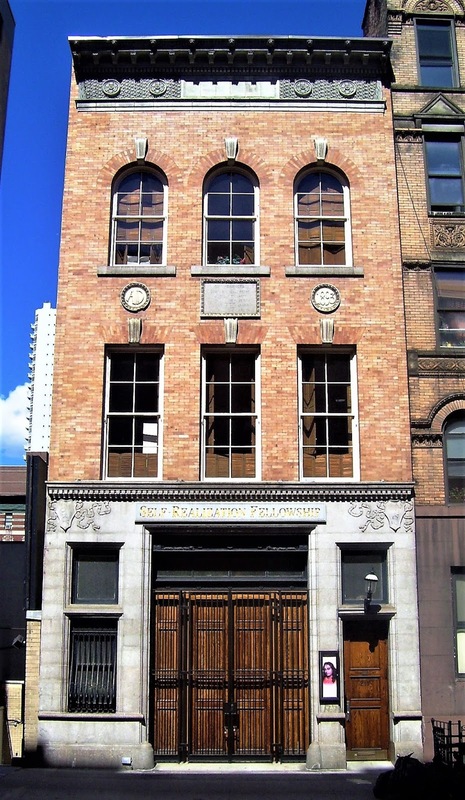 The firehouse was converted to photo studios and offices on the first and second floors, with a single-family duplex above. Then, in 1995, it was converted as the New York City Center of the Self Realization Fellowship, a religious movement founded by Paramahansa Yogananda, the author of Autobiography of a Yogi. In renovating the structure, the group preserved LeBrun's stately exterior, so that it appears generally little changed from when Hook and Ladder Company 7 proudly moved back into its updated home in 1893.